Today you'll get another quick tutorial from the demo last week. 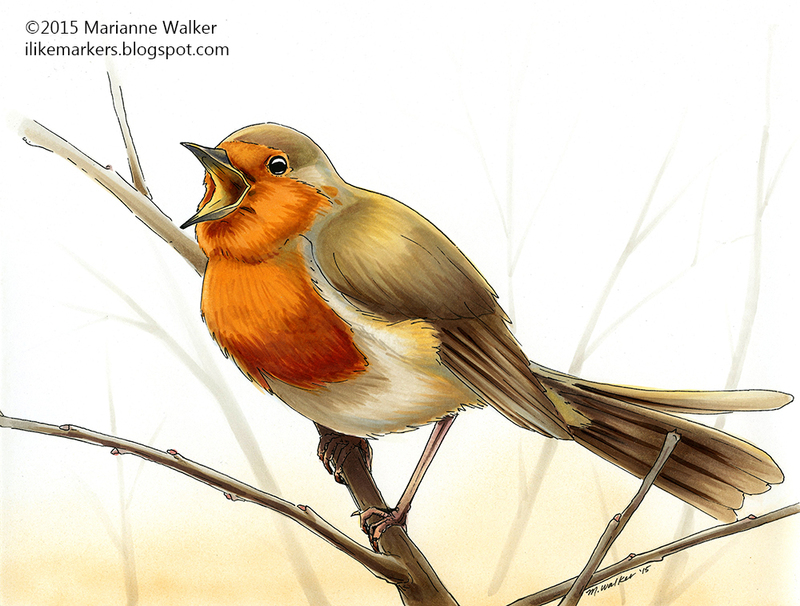 This time, I have a picture of a cheerful red robin, again, drawn from a photo taken by my friend Maaike. Today I want to just show you a quick sample of the power of a background. 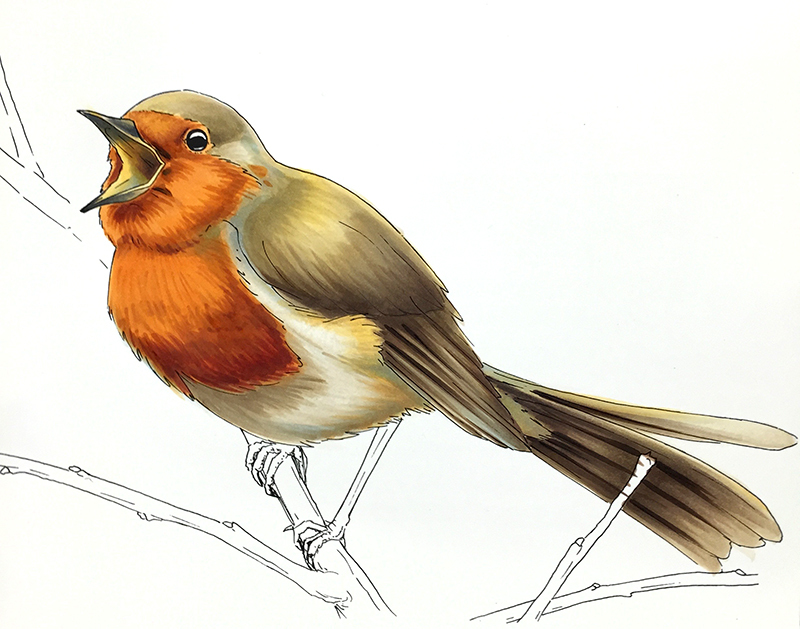 Here you have the red robin before I added any color to the background. I can't remember all the colors I used, but I know I worked heavily with the E40's family: E40, E42, E43, E44, E47, E49, and I warmed up the tones with an overlay of YR30 and Y21. I also used W1, W3, W5 and B91/B93 in the shadows. I also used YR12, YR14, YR18, and E09 in the feathers. Next I need a background. He looks very sharp without one, but the picture looks incomplete. I also didn't want the background to overpower the foreground. So, I chose a very light E70 and W1 and drew in the suggestion of twigs in the background. Further away, I made them lighter. Then, I took the same pale yellow I used on his wing and lightly airbrushed the suggestion of a glowing sunrise or mist only along the bottom of the page. Nothing too strong, just a suggestion of color. 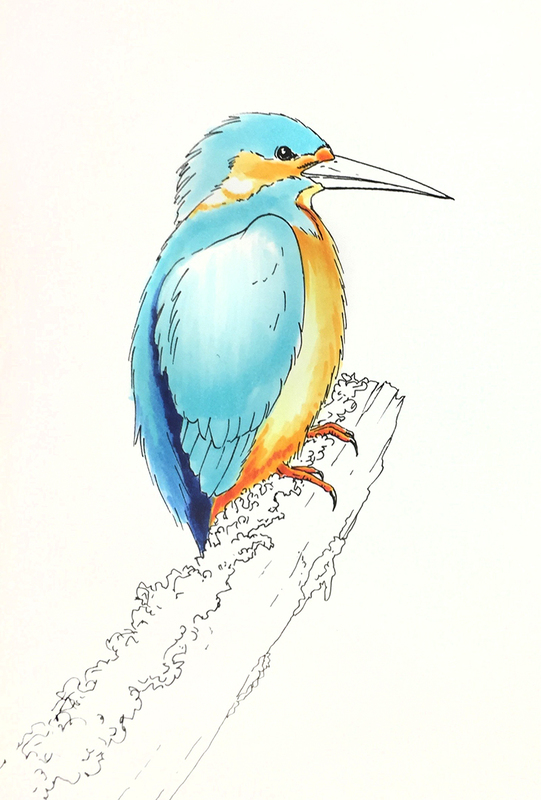 Overall, I really like the feel of this bird, it's very different from what I usually make. I hope you have a fabulous Fall! Like this robin, just keep singing, no matter what life brings! Last week I had the pleasure of coloring for two days straight at the U of O Bookstore. What fun I had! 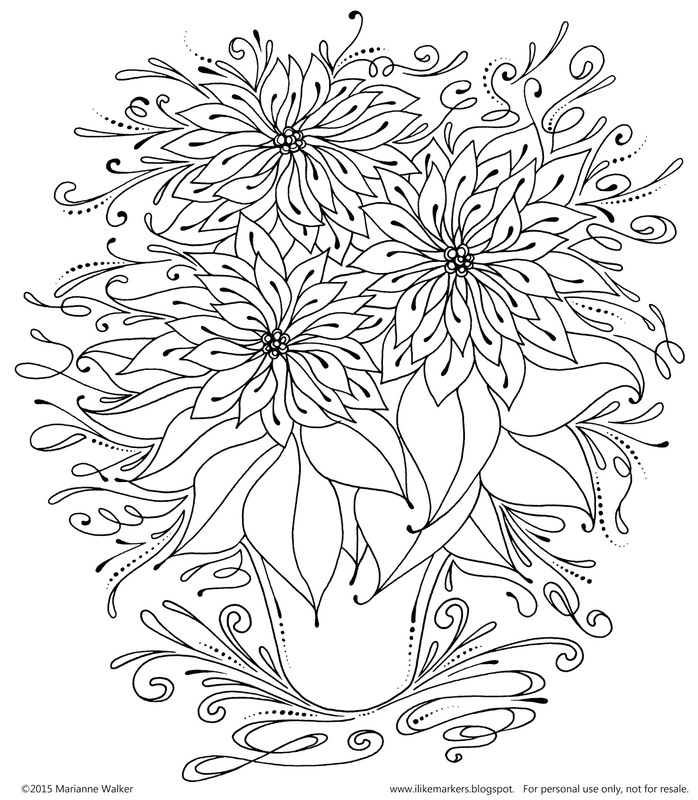 Any chance to sit and color is a win in my book. Since I have been working on a new book, Coloring Birds with Copic Markers, you can guess that I have been focused on birds quite a bit recently. 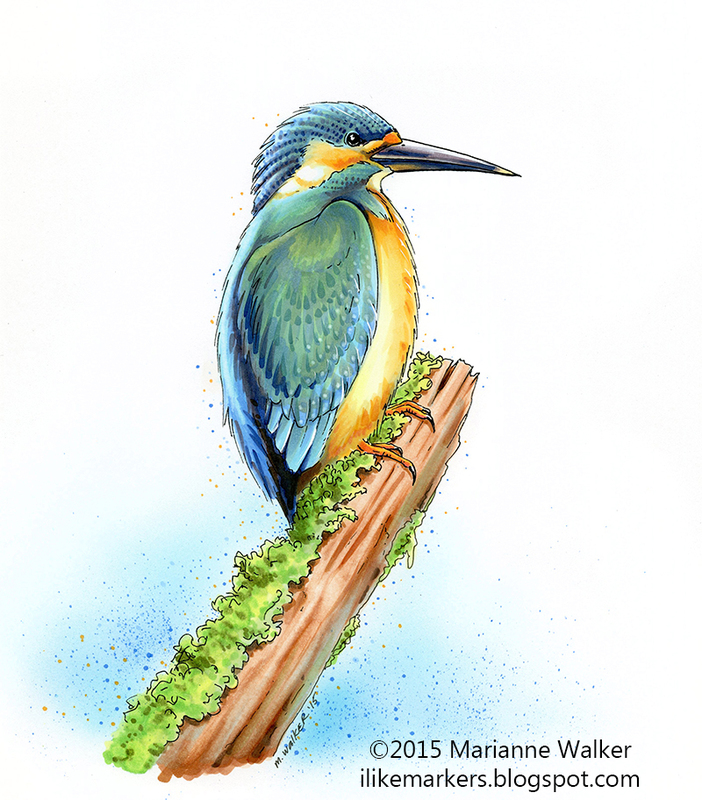 One of my dear Facebook friends, Maaike from the Netherlands, shared some beautiful bird photos from the Wildlife Refuge she works at, I knew I had to draw some of them. This kingfisher was my favorite from the whole event. I drew him with a 0.1mm multiliner, then photocopied the outline onto some of our Art Paper. I started by lightly blocking in the base tones. (I apologize in advance if I leave out any colors, as I didn't write down all the colors I used, so I'm going by memory). I used BG01, B24, B39, Y11, YR31, YR14, and YR18. Notice the light feathering strokes I used on the wing and chest. The first spot you touch your marker nib down will be darkest, so pay attention to the affect you are trying to get, planning where your light and dark feathers will be. Sometimes I flick up the wing and other times I flick down on the wing. I try to always flick in the direction the feathers naturally grow though, so that it looks most natural. Next, I went through section by section and darkened. I didn't have a great range of turquoise colors, so I had to build them by layering G43 and B24, frequently in feathering strokes. I darkened the head with thin lines of different blues. Then with the very tip of the brush nib, I added tiny rows of dots to the crown of his head, to simulate the fine striped feathers. 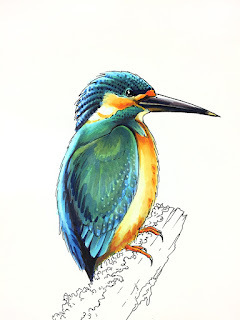 The beak was colored with C3, C7, C9, Y32 and a hint of YR14. I was careful to darken the orange area on the head, while keeping the white areas white. At this point, I start really popping out the contrast and finishing details. With B39 I added even more dots to the crest of head feathers. Notice I also punched out the contrast on the wing feathers with the B39 as well. 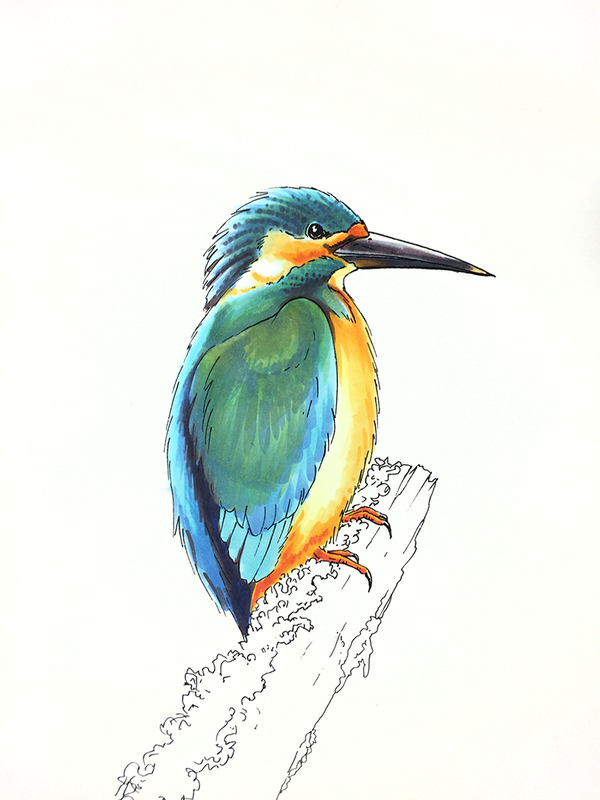 I darkened the wing feathers in front as well with more 24 and a bit more green. BG13, BG18, B95, B9, V99 and many other colors. This gave the feathers on the wing a bit more punch. At this point I let them dry throughly. Next, I took the finest tip of the colorless blender and carefully dotted in the white dot accents on the wing feathers. If the base color is still wet, then the dots will be soft and blurry, but by letting the base coat dry, then adding many layers of blender, letting it dry between layers, I was able to lighten up the dots. Finally, I finished the bird by applying faint hints of Copic Opaque White. This popped out the contrast on the wing feathers and on his head-crest. The branch is colored with layers of E11, E13, E15, E37, and E49. Then, I softly added some YG11 over some spots to suggest a green fuzz. The moss is colored with YG01, YG03, YG13, YG67, and hints of G99. 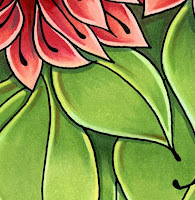 I faintly airbrushed a background using the chisel nib on a B02 marker, then added darker speckles of color with the brush nib on a B24. Then, I used the tip of the B24 and YR14 marker and added teeny-tiny dots carefully around the edges of the illustration, just because I thought it looked cool. Free Demos, Workshops and more! Fall is a busy time of year for me, and this year, as I've been working hard on my next few books, it has been extra busy. However, I have a lot of great local Copic events coming up in the next few weeks, so come and check out the stuff I've been working on. (After the new year, I'll list my demos around the country). Free demos all day. I'll be downstairs at the bookstore, next to the marker rack, drawing all sorts of cool things. I'll be hosting a couple of workshops each day. For admission times and pricing, please visit the Eucon website. Free demo from 2-5pm. 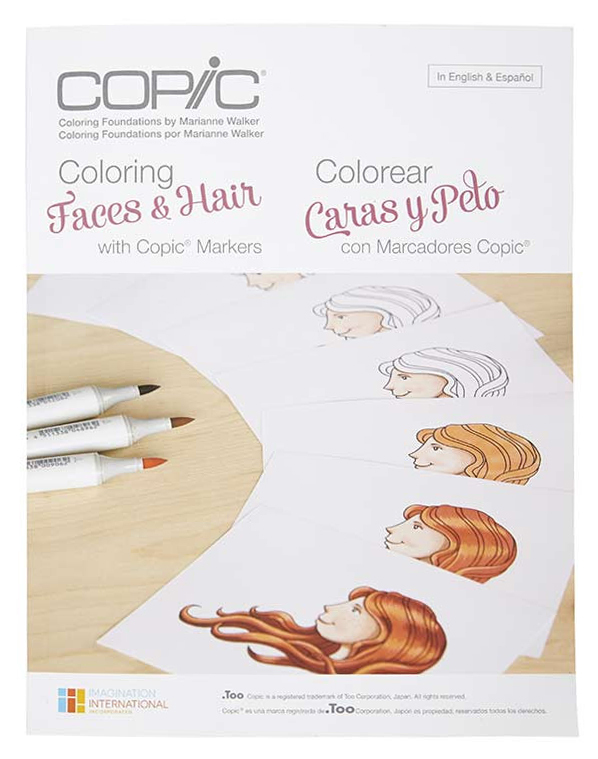 Come check out my new books and learn about Copic markers. I think you'll be excited to know about my next two books, available in a few months. 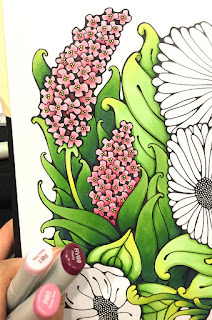 Intro to Coloring with Copic Markers and Coloring Cats & Dogs with Copic Markers. Both will be available after the first of the year. 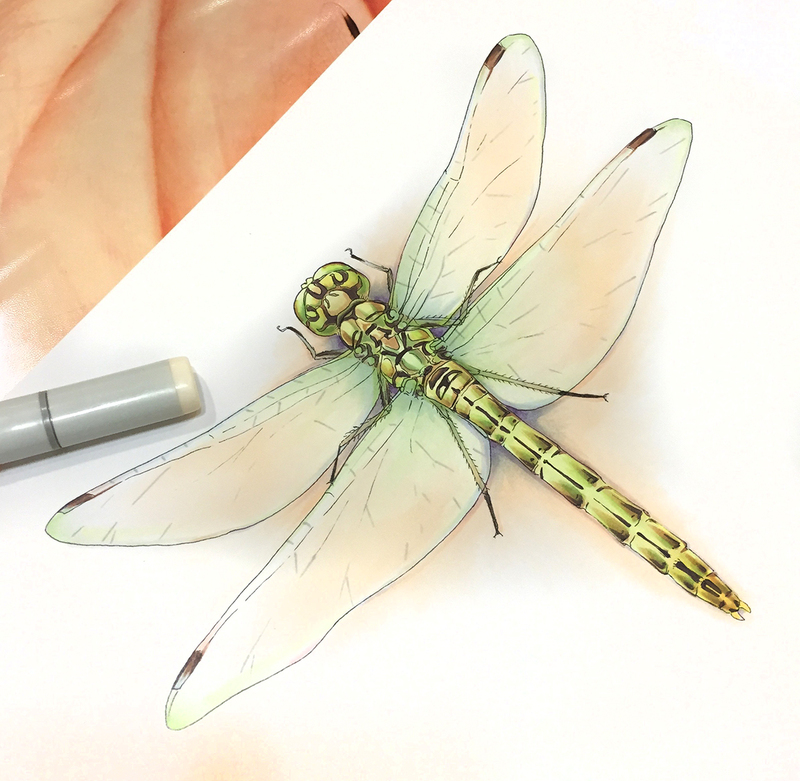 About the dragonfly: I colored this dragonfly this weekend at a training session. I used a lot of very pale colors, E000, YG11, BV00, B91, Y00 but then I made them pop with hints of darker colors. YG13, E21, E25, V99, E31, BV23, Y13, and probably a few more colors I forgot to list. I drew the dragonfly based on a photo sent to me by my friend Maaike. 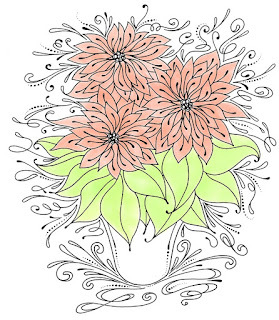 The picture is colored on the Art Paper you can find here. A few months ago I had a chance to draw this really awesome butterfly. Drawing things like this is very meditative for me- I'm sure many of you can relate. 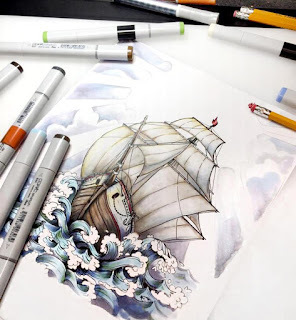 It took many hours to draw, and I drew it with a 0.03mm multiliner on the Copic Art Paper (sketchbook paper). 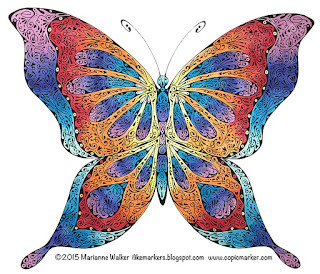 If you would also like to color this exact butterfly, it is now available for download here on the Copic website, along with a few other doodles in a similar style. 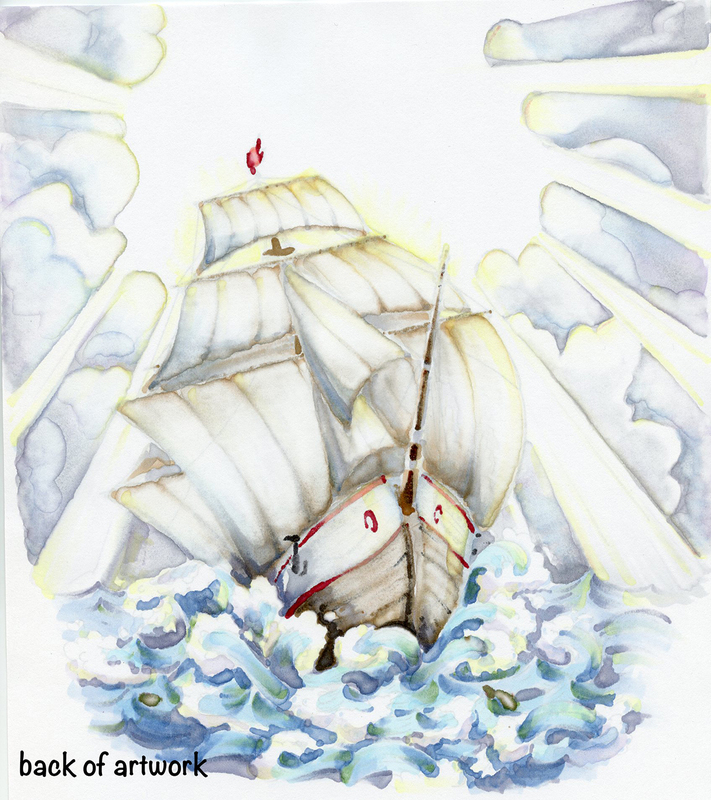 Check out our whole range of illustrations for download, since they're only $0.99 each. Anyways, I was at a demo recently and I had a chance to color the butterfly. 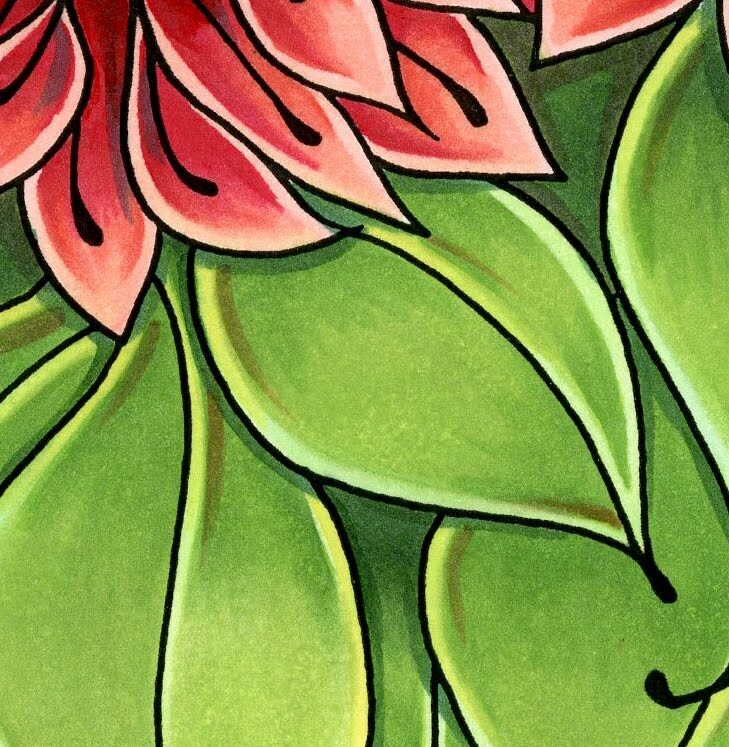 Although there are many many details, when you color it, you can choose to ignore most of those details, and have them just become part of the patterning. I printed the butterfly on the Copic Art Paper so it wouldn't bleed when I colored it in. The technique I used for this entire image is feathering colors. I started with a light V12, feathered up, then I took a B66 and feathered down into the V12, and I went back and blended with the V12. Then I feathered the B66 up, feathered a B04 down, then blended with the B04. I feathered the B04 up into B02, and that up into B00. I repeated the process up along the top edge of the wings. Then, I went into each of the inner segments and repeated the same color scheme. Once I'd finished those sections, I colored the main background of each wing with a feathered gradient from Y11 into YR65, and finally into R37. Although the finished piece is a full sheet of paper, it was surprisingly quick and easy to color (I think it took about an hour, and I was demoing for customers as well). I love how vibrant the colors appear! the finished piece looks a lot more complicated than it really was. The store that I was demoing at liked it so much, they asked if they could keep my colored piece. I was happy to share it with them, since it was so easy to color. 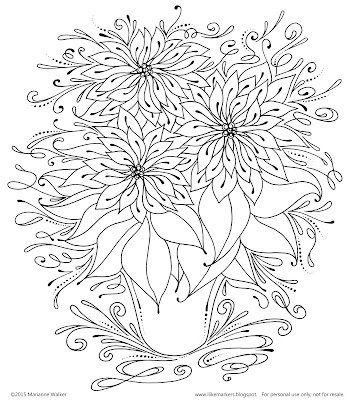 If you are looking for something a little different to work on, I encourage you to check out our full collection of downloadable coloring sheets and make your own fun artwork. Have a relaxing week coloring! Another week, and I hope you had fun coloring with someone you love. I have some great workshops coming up that I thought I should share with you. Whew! A busy month ahead. So, last week I asked who you like coloring with, and I got so many wonderful comments. We randomly selected a winner: Terri! I love coloring with my little granddaughter Dahlia. She's 4 1/2 and is so into crafting with grandma! It's fun to watch her start learning to color inside the lines and wanting to make a card! 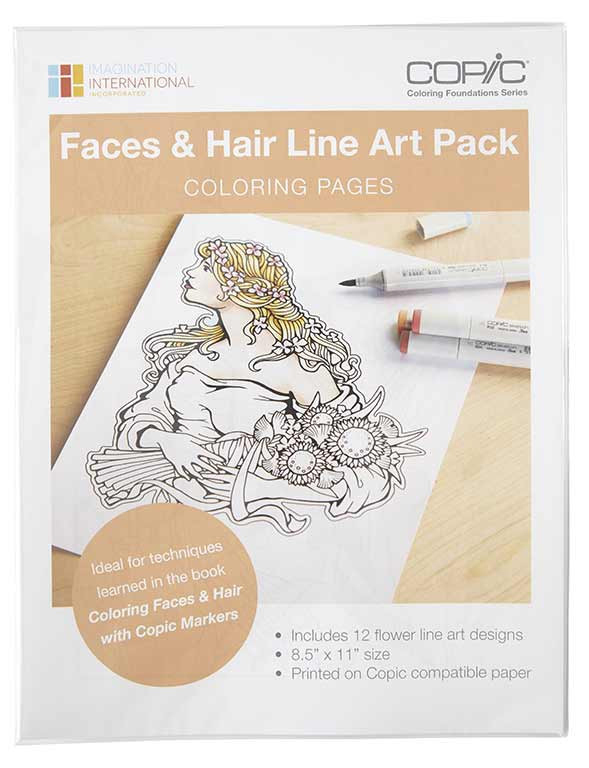 A few months ago, I had the pleasure of teaching a Tracing Memories/Coloring Photo Line Art class at my local library. What made this class different is that I actually got my Mom to attend. A little backstory- My Mom has an art degree. She was an amazing oil painter, both portraits and landscapes, but she gave it up when I was very little because she had a house full of 6 kids and no room for painting. So, she shifted to self publishing quilting books as part of her creative outlet. She hasn't drawn or painted much in the intervening years. She always told me growing up, "Never get an art degree, you'll never make any money with it." I think that my family expected me to be a doctor or a lawyer or something like that (Not a chance!). 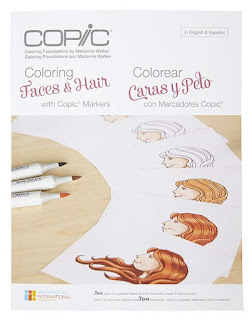 Mom didn't really like my simplified, cartoony drawing style, and she just couldn't relate as well to my simplified, over-blended Copic illustrations. Flash forward- Mom comes to my workshop where we are coloring a photo from a local park. It was a much more painterly, realistic style and it resonated with her. She got into it. She connected with a sweet family who took my class. And then, mom started her own relaxing coloring group at the local library. Mom would bring her markers, until the others built up their own collections. They would meet once a week to color whatever images struck their fancy: Mandalas, photos, manga...anything they found that they liked. They gabbed about life and family and whatever. It became the highlight of their week. They had fun coloring. It brought peace and stress reduction to their life. Look around you. 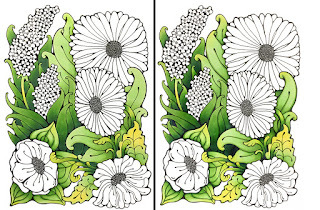 Are you happier when coloring? Are you in the zone? Do you feel the peace that comes when you tone out the world around you and color what you love? Have you seen all the articles in the news recently about how popular coloring is, and how good it is for your health? 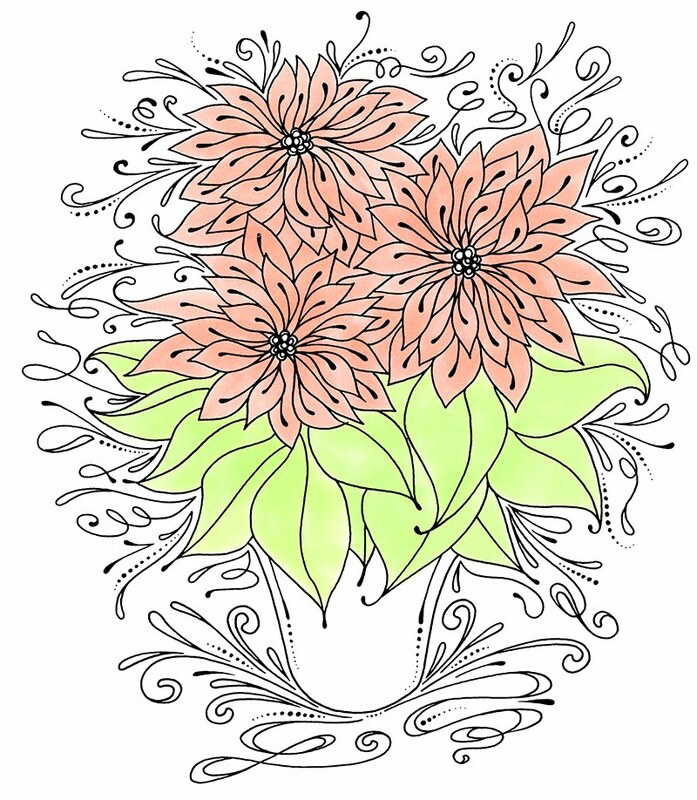 Coloring is Awesome! 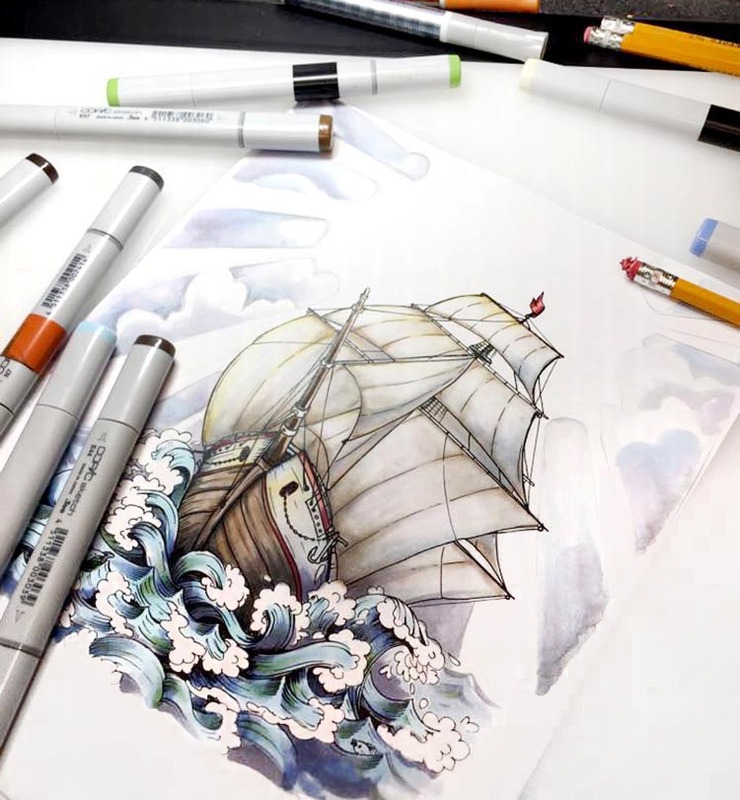 I really want to hear your coloring story. What motivates you to color? Is it to cope with the loss of a loved one? Is it because you can squeeze it in on long road trips? Is it because you remember coloring with your grandma when you were little? Please send me an email with YOUR coloring story and maybe a couple photos. I will choose some stories here and there and share them with others for inspiration (Don't worry, I'll let you know if your story is chosen). 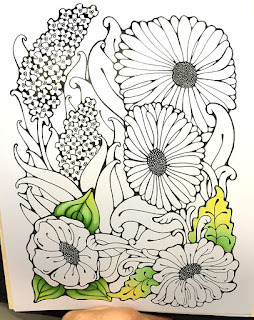 If you've felt that relaxation that comes from coloring, then I challenge you with this- have you gone out of your way to spread that happiness with others? 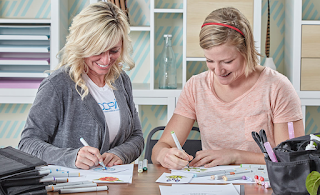 Have you invited someone over to color with you? Someone who has never tried coloring before? This Summer, take a moment and color with someone who needs a break. It could be a stressed out co-worker, a friend in an assisted living center, a child or an aging parent. 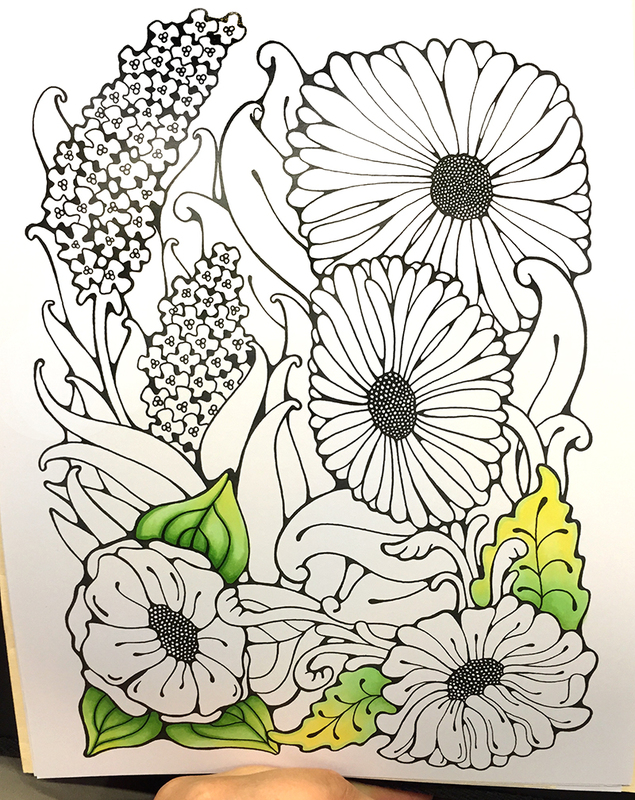 Just block out some time and color! 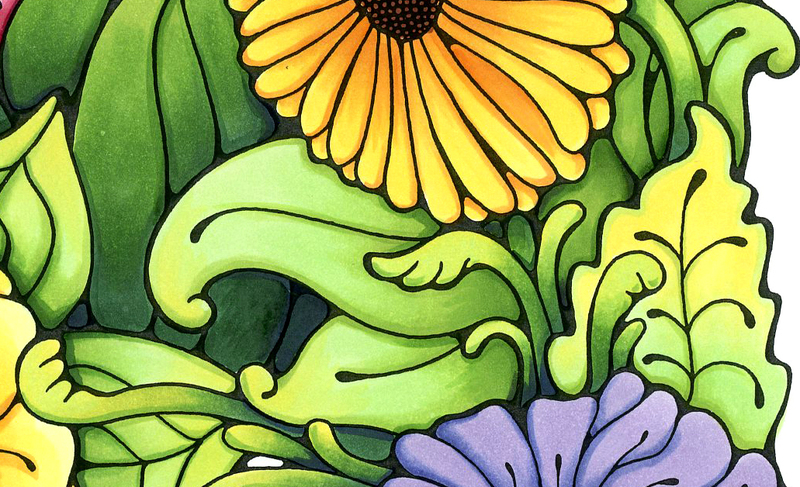 Please leave a comment on this post, tell us who you love coloring with or who you want to color with, for a chance to win a copy of my Coloring Flowers book + a selection of flowers line art printed on our specialty marker paper. My goal is to encourage people to relax, and more than that, help someone else relax. One thing this busy world needs more of is simple relaxation. Go back to your happy coloring place and bring someone with you. I will choose a winner on Friday. Thanks and have a colorful week!! If you live near Eugene/Springfield, OR, and you love creating art outdoors, then we have a great opportunity for you! Join our Plein Air and Chalk Festival on August 15th, sponsored by Imagination International, Inc. (that's us). Cash Prizes! Visit the registration site for more details. 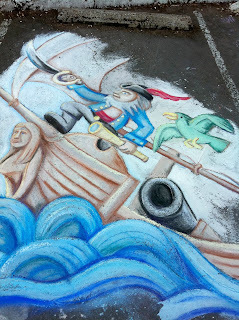 Last year, I participated in the chalk drawing portion, and had a blast drawing my whimsical pirate! I've never participated in a chalk drawing event before, since markers are my main art medium. It was a wonderful challenge. There were lots of people who stopped by to see the great artwork being generated. It was so much fun to see families and friends wandering by to better understand the process that artists go through. So even if you aren't participating as an artist, please come and see what excitement is going on. This year is even better, since artists will be allowed to draw, paint, or create all over the downtown Springfield area. So, please join us for this fun summer event! Today I will be teaching workshops at Main Street Stamping in Tigard, OR. 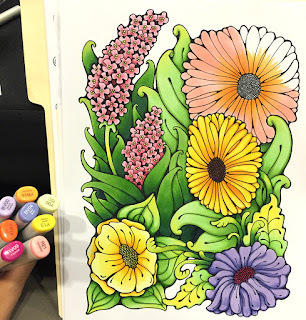 All my classes are from my new book, Coloring Flowers with Copic Markers. If you would like to come pick up an autographed copy of the book, stop by from 4-5pm. I can't wait to see you there! 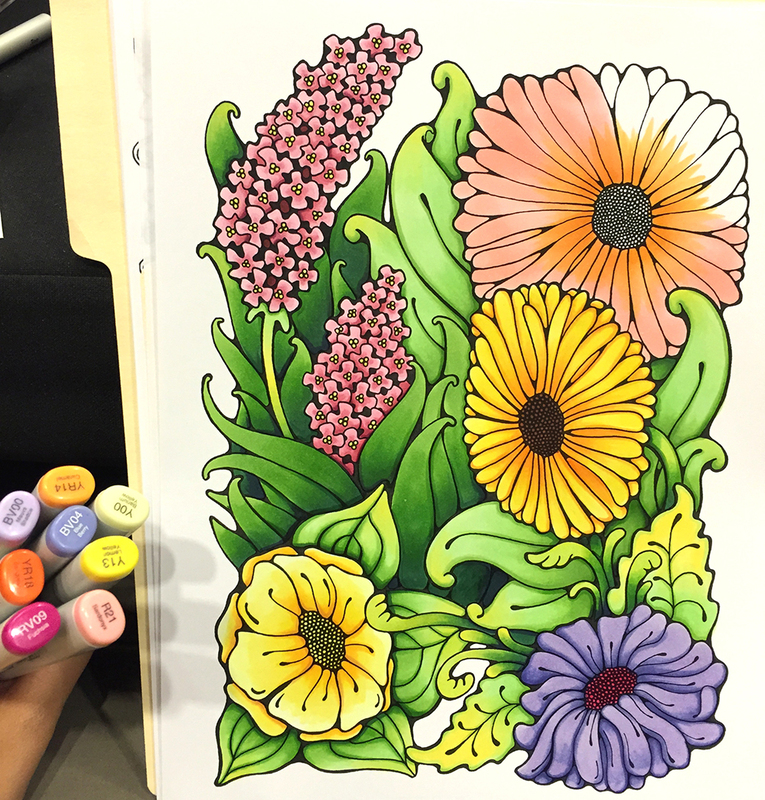 Last week I had the pleasure of coloring all afternoon at a demo. It's so relaxing to just sit and color. sigh. I wish life gave us all more opportunities to just sit and color. 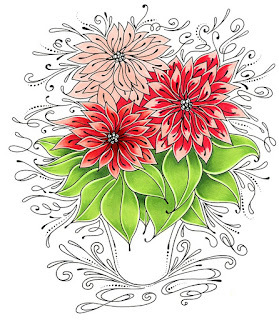 Can you imagine how much nicer everyone would be if they spent an hour each day coloring? Anyways, while I was at the demo I colored this flower image you can download from the Copic website. Many of the flower images I drew to match tutorials found in the Coloring Flowers with Copic book we sell. 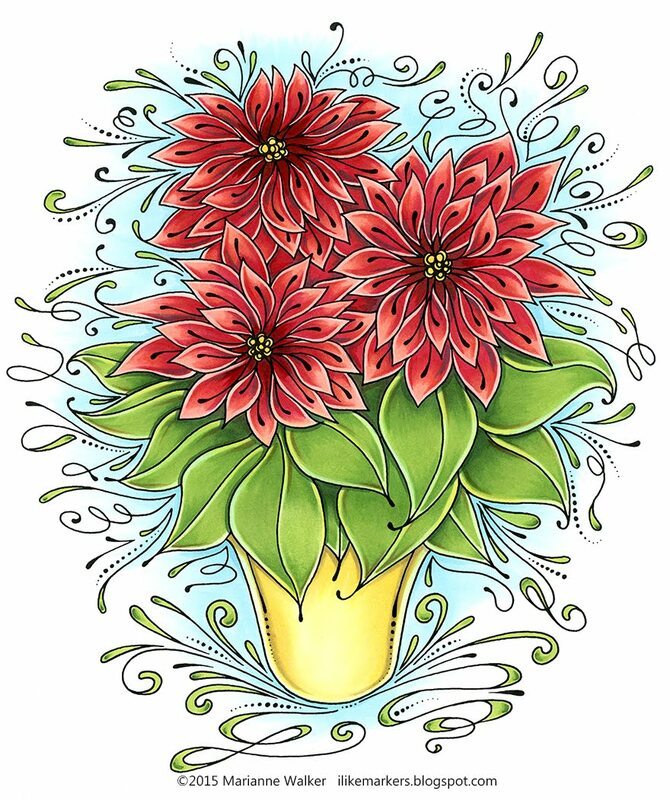 This picture I drew for our website to match the 4th project in the book, so, in the book you learn how to color this style of flower, using palette blending for the dark colors. While coloring at the demo, I only took step-by-step photos of coloring the girl because the flowers are discussed in the book. Even though this picture is simple, I tried to keep my shadows consistent on the little girl, with the sunlight hitting her face strongest. 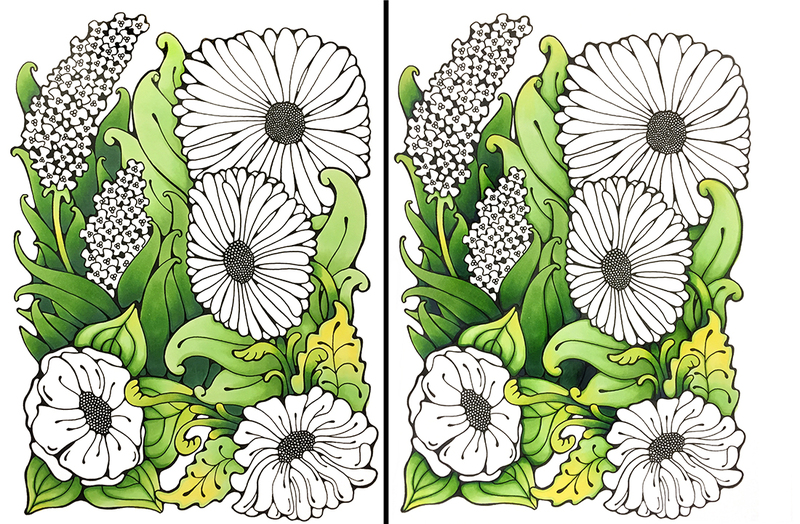 The flowers are more of a design element, so I just colored those in, without much worry over shadows, except a little bit on the leaves. I started by coloring her dress with a base of R81, and added shading with R85. I knew that the hearts would be a darker purple, so I just colored right over the pattern and didn't stress about coloring around them. The darker purple is V06, with shadows of RV69. Notice how I left a lighter highlight on the back of the dress, along with the stronger highlight on the front. 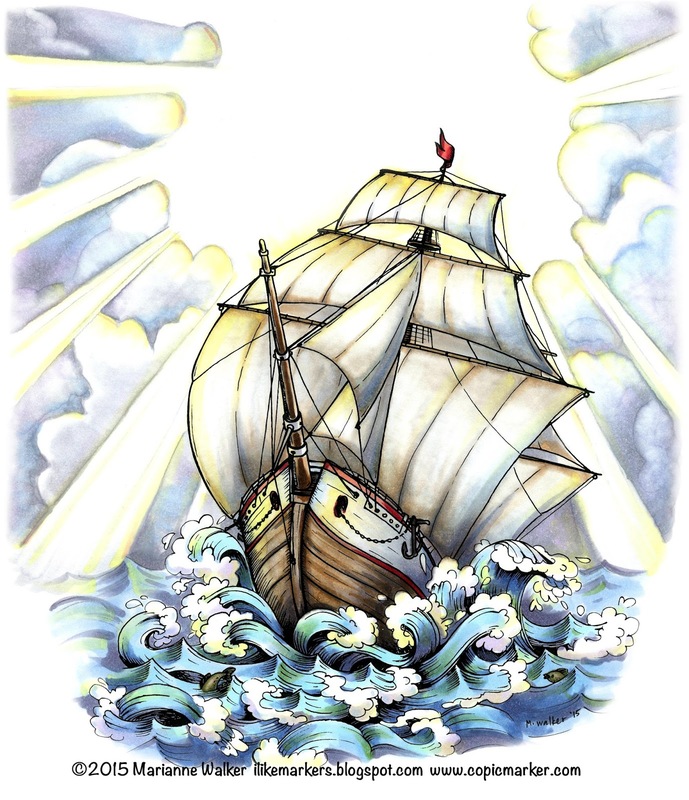 This makes the shading stand out more. Be careful not to blend out all your contrast, or your work will look too flat. High contrast makes art more interesting to look at. I colored her skin with E00, E21 then added shadows with E13. I added light layers of B00, R30, and a hint of R31 to change the tone. Her basket was colored with E31, E35, and R39. 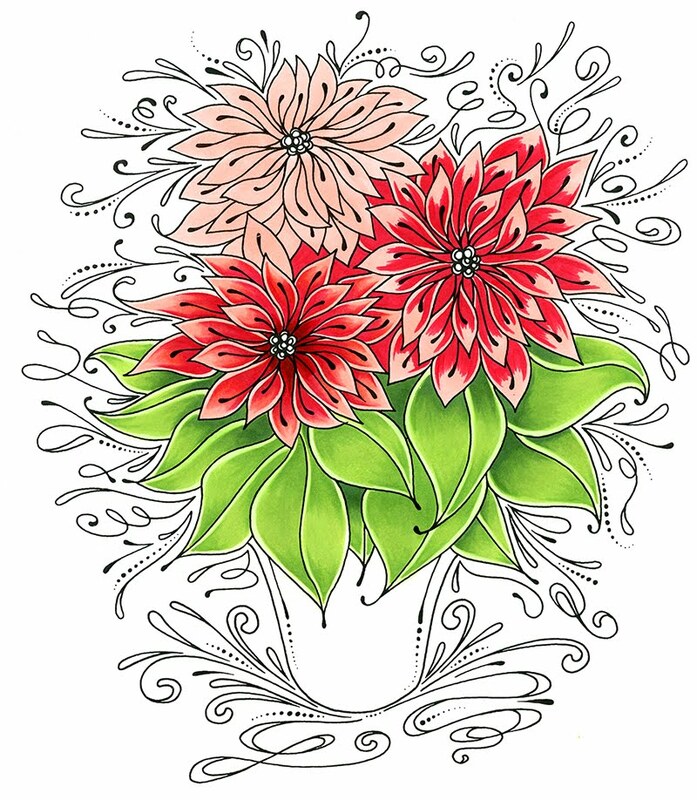 Then I worked on coloring the flowers. The yellow flowers are colored with Y32, YR65, and R05. Centers are E35. The pink flowers are R81, R85, R39, and centers are RV69. Leaves are YG11, and YG17 (notice how much contrast I use in my greens, I jump straight from YG11 to YG17. It makes them more vibrant). I darkened the deepest leaf shadows with G28. I finished with a pale B00 sky background that I faded out to the white of the paper using the Colorless blender. I had such a relaxing time coloring this picture. It took about 2.5 hrs to color, since it is a full sheet of paper and I was also helping customers during that time. 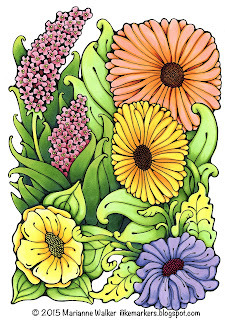 Coloring all those little flowers kept my hands busy while my mind wandered. I ended up staying at the demo an extra hour or so because I was having so much fun coloring! I'll be sure to post some more tutorials, even though I am super busy writing my next two books. Have a great weekend! A few weeks ago I was at a demo up in Winnipeg, Alberta. 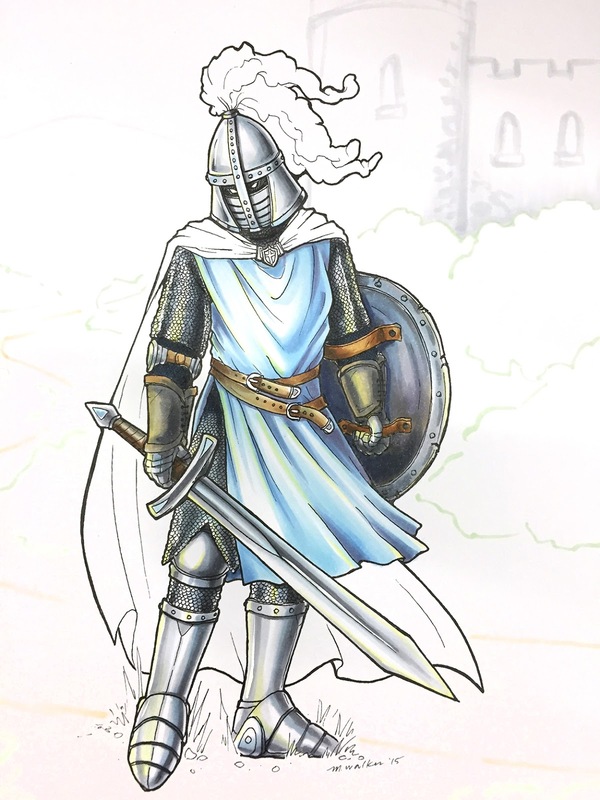 I had a chance to make a quick sketch of a knight and color it in the second day of their open house event. I don't remember exactly what colors I used, but I will try and guess as I show you a few step-by-step pictures. I drew this guy with a 0.05mm multiliner onto Copic Alcohol Marker Pad paper. 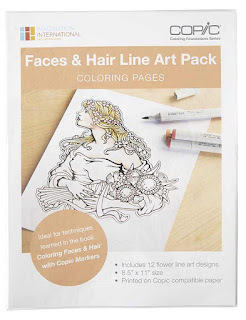 Then, I photocopied my outlines onto the new Art Paper Pack paper (Copic Sketchbook paper). 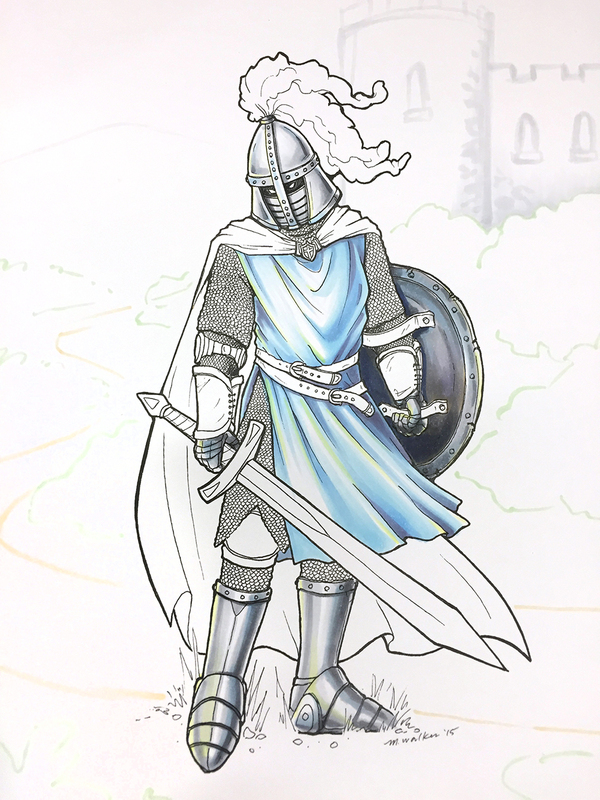 I began coloring his blue surcoat. I think I used B000, B32, B45, BV13, Y00, and maybe a couple others. Notice how I left the highlights on each wrinkle a clean, crisp white. This enhances the shadows and adds a nice contrast on a fabric that is supposed to appear pale. Then I moved onto his reflective metal. Notice the strong contrast, the bright whites that I left, right next to the dark grays. I used a wide range of the cool gray markers, then added highlights of Y00, and extra shadows with B000. I can't remember what colors I used on the back of the shield, but I gradually built up colors and contrast until I got the look I wanted. Notice the light sketch suggesting a background. 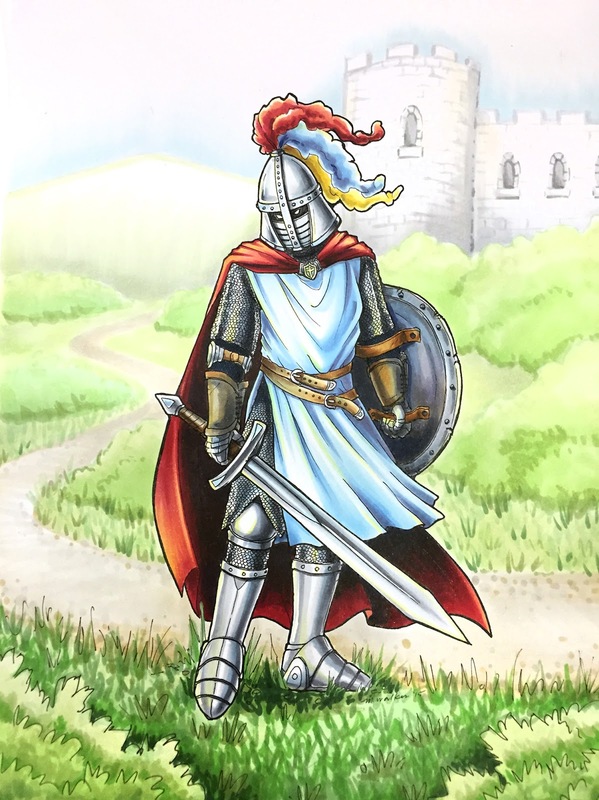 I didn't want hard lines to define the background or foreground, as I wanted to keep the knight the most important/highest contrast object in the picture. I kept working around his image, darkening the chain mail with the same cool grays I used on the shinier metal areas. On his arm bands, I wanted a different feel. I honestly don't remember what material I was trying to achieve, just something kinda dusty so it didn't conflict with the other metal in his ensemble. The leather straps were closed with a range of E11, E13, E15, E18, and some grays. Again, notice how I left strong contrast on the metal sword, but included faint highlights of pale yellow to enhance the white areas. Here is a quick photo of the final image. I colored the cape with R24, R29, R59, Y00, and B39. To simulate depth of field in the illustration, I kept my highest contrast on grass and shrubs in the foreground, with details and color range getting lost as it heads off into the distance. I finished up with highlights of Opaque White on many of the metal objects. If you are working on a piece of art, don't get hung up on the flaws! Just try next time to do it better. I know what I want to change next time I draw a knight. However, the parts I really like are the colors on the surcoat and cape. I also like how I colored the helmet and steel boots. 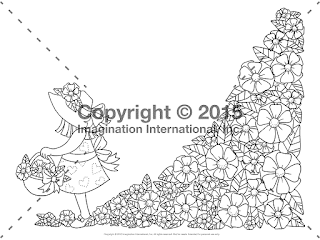 Meanwhile, don't forget to come visit me at my free book signing events for my Coloring Flowers book!